A few weeks ago I was contacted by a company called eShakti and was asked if I would be interested in reviewing a product and my experience from their site. I have never heard of this site before, but when I did a bit of research and found that they were a custom clothing shop that’s what attracted me the most. I had the opportunity to choose any garment available on their site, and once I picked that item, I would customize the garment according to fit and style. I’ll be honest; it took me a good while to actually find something that I really liked. For me, there was not a lot of options to choose from, which is crazy because eShakti has a wide variety of selections. I guess I was also trying to pick something more practical, something I can see myself wearing more than once. After going through the site a few times, I came down to my top three, the faux fur vest, the houndstooth skirt, and a pleated skirt. 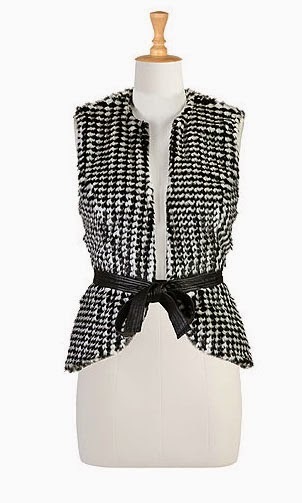 Out of the three, I chose the faux fur vest, but it was super close with the houndstooth skirt. As for my experience with their customization, it was fairly simple. Since I chose the vest, the custom styling was either same length as it’s shown in the picture or at a low hip length; I chose the same length option. Above that, they simply just ask you what is your size for bust, waist, hip and your height, very explanatory. Although I was looking at the custom options for the skirt, and there were more options for the length of the skirt, so I am curious to know how that would have played out. When I finished ordering, I received a confirmation email from eShakti stating that my order has been received and that it would typically be processed and shipped in about 7-9 working days. I feel like it took them a bit longer for the product to ship, but when it did, it was delivered within 1-2 days. The company uses DHL shipping, instead of the usual Fedex and UPS. I have read really bad reviews on them and anticipated that something would go wrong. But prior to delivery, I received a text from DHL confirming their arrival and to make sure I will be home at that time. Luckily, since I was home, the shipping process went smoothly. Since the vest has a black and white detailed pattern, I decided to wear my plain black knee length dress underneath, and to add a bit of a 'pop' I wore my blue pointed heel, which helped to finish off my classy look. During the same week, I was contacted by Megan from Megan’s Beaded Designs; she is a jewelry and hair accessories designer. Megan had also sent me a product from her site. I really find it fascinating when people can design their own products, especially jewelry. I was happy to partner up with her and review her product. From her wide selection of jewelry and accessories, I ended up choosing the Beaded Silver Bracelet. Overall, I was really happy with the vest and the bracelet. I really liked the peplum part of the vest, and despite the belt not removable, the combination of the two is very girly and lady-like, which fits my style perfectly. As for the bracelet, it was delivered to me exactly how it looked in the picture. This bracelet can be worn with casual outfits as well. As for size, it fits fine, but it seems to flip downwards often, which might be because my wrist is a bit smaller than others. This look is perfect for a day out to lunch or out on a lovely dinner date. I also wore red lipstick and a simple black clutch. Remember the vest and heels are already popping out, so you don't want to overdo it. If you would like to shop this vest or any garment, visit eShakti.com or use the direct link here. & of course make sure to check out Megan at Megan's Beaded Design. Use code 'Nancista' at checkout for a 10% off discount.